MALAGA, Spain, Sep 23 2011 (IPS) - “I want to thank the 15-M. I will not forget them,” Algerian immigrant Sid Hamed Bouziane, whose deportation order was revoked after a group of activists from this burgeoning Spanish protest movement held an 11-day demonstration on his behalf, told IPS. Bouziane, 29, who faces death threats in his country, spent 28 days in the Migrant Detention Centre (CIE) in the southern Spanish city of Málaga after he was detained by the authorities. The opposition activist told IPS that he fled Algeria in 2008 when the military police tried to force him to infiltrate an armed anti-government Islamist group. After he was arrested several times, he agreed to the order to infiltrate the group, in order to be released. But then he fled to Spain in a “patera”, the duck-hunting boats commonly used by those trafficking undocumented immigrants to Spanish shores. Upon arrival he did not dare ask for asylum “out of fear, and because he lacked proof,” his lawyer José Cosín, a member of the May 15 Movement (15-M), told IPS. Once he was detained and given legal support, he applied for asylum. But it was denied, and a date was set for his deportation from Spain. The 15-M held protests to demand that the deportation be halted, and that the CIEs be closed “because they violate the most fundamental rights of human beings,” according to the members of the movement, who call themselves the “indignados” or “indignant” or “angry” ones. “Managing to stop Bouziane’s sentencing to death was a success for our movement. No human being is illegal,” said Cosín. He also noted that the government cancelled the deportation order in August after the Algerian activist married his Spanish girlfriend, Candela Mayorgas, thus gaining the right to stay in Spain. Four months after the original May 15 sit-in protest stretched into a full-fledged tent camp at Madrid’s Puerta del Sol square, giving rise to a growing wave of massive rallies and protests around Spain, the “Spanish revolution” – as it has been dubbed by the press – has been making bigger and bigger waves. The “indignados” began to organise via social networking sites such as Facebook and Twitter to hold spontaneous demonstrations against the government’s economic and political performance in the midst of the worst economic crisis in decades. The movement has so far blocked more than 65 evictions, although an average of 175 evictions a day were carried out in Spain in the first quarter of 2011 as a result of the real estate bust, Esther Vivas, a member of the Centre of Studies on Social Movements at the Pompeu Fabra University in the northeast city of Barcelona, told IPS. Due to the economic crisis, thousands of people have failed to keep up on their mortgage payments and have been forced out of their homes under a law “that shamefully protects banks and leaves citizens completely defenceless,” Cosín said. Under the current law, for example, it is not enough to merely hand over the housing unit to the bank to cancel the debt; lenders can foreclose not only on the house but seize all the assets, including part of the wages, of the debtor in order to cover the outstanding mortgage debt. The Platform of those Affected by Mortgages (PAH) was established on Feb. 22 in Barcelona to complain that the poor regulation of the banking system means that not only do families lose their homes, but they continue to owe money on their mortgages, because of the way banks are appraising the value of homes. 15-M has not only blocked evictions but has also successfully lobbied Congress to adopt protective measures for mortgage holders, such as raising the proportion of wages that cannot be garnished to pay off debts. The movement has also pressed for legal reforms to approve “dacion en pago” – which basically means handing back the keys and the property in exchange for the bank discharging all mortgage debt. This solution, however, was rejected by all of the major parties. But the protesters have managed to get some banks, like Bankinter, to adopt “dación en pago” on all mortgage loans, while Banco Santander has offered a three-year mortgage payment suspension for clients who have lost their jobs, or families that have seen a 25 percent drop in monthly income. “Of course the movement has achieved some things,” Professor Jaime Ferri at the Complutense University political science department in Madrid told IPS. In Málaga, one of the largest cities in the southern province of Andalusía, 15-M successfully pressured the regional parliament to begin to study a “popular legislative initiative” (ILP) presented on May 31 that would boost citizen participation in political decision-making, Cosín said. “This is an achievement for everyone, because the initiative attempts to get citizens more involved in the process of creating laws – a right that they currently cannot exercise,” said the lawyer, pointing out that no ILP has been approved in Andalusía in nearly 40 years of democracy. Another victory by 15-M was to prompt a debate on the need to reform the country’s election laws, which favour the large political parties, in order to increase social participation in decision-making. Members of the conservative opposition People’s Party, such as the governor of the province of Madrid, Esperanza Aguirre, are now defending the use of open lists of candidates, while the governing Socialist Party has proposed reforms inspired by the German system, with a more proportional distribution of seats. “The current election laws thwart participation by small parties,” said Vivas at the Pompeu Fabra University, who also criticised a recent constitutional reform that allows public spending to be limited. According to the 15-M, this will hurt spending on education and health. Vivas pointed to the strong presence of the “indignados” in protests over the last few months against cuts in public spending on health – closures of hospitals and health clinics and a reduction in the number of ambulances – in the northeastern province of Catalonia. The 15-M set up camps outside the health centres, where they demonstrated alongside health professionals, neighbourhood associations and health consumers. On Sunday Sep. 18, the “indignados” poured onto the streets of Spain’s largest cities to protest the reduction of budgets for public services, demanding the right to health care and quality education. 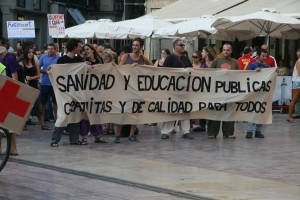 Chanting slogans like “divert military spending to schools and hospitals” and “less corruption, more education”, hundreds of people responded to the 15-M’s calls to march through the streets of Málaga behind a huge banner reading “free quality public health care and education for all”. In Catalonia, hundreds of health clinics and wings of hospitals have been closed; in Castilla-La Mancha in central Spain hundreds of pharmacies went on strike to protest the non-payment of bills by the government health authority; and in Madrid, teachers protested cuts in education, a 15-M statement says. As a result of the crisis, there are more than four million people unemployed in Spain – over 20 percent of the labour force – and the highest jobless rates are among the young. The government of socialist Prime Minister José Luis Rodríguez Zapatero, who called early general elections for Nov. 20, took a radical shift in its politics in May 2010, under pressure from the European Union, to confront the growing levels of debt and avoid a financial bailout by the country’s Eurozone partners. The drastic adjustment plan was fiscally successful, but at the cost of slashing social spending and driving up unemployment, the most pressing social problem today. According to Professor Ferri, “the 15-M will help mark the agenda for the future.” He is a front-row observer of the phenomenon, as many of his students are taking part in the movement that is now extending to neighbourhoods and smaller towns, after ending the major sit-ins and camps in the central squares of the main cities.